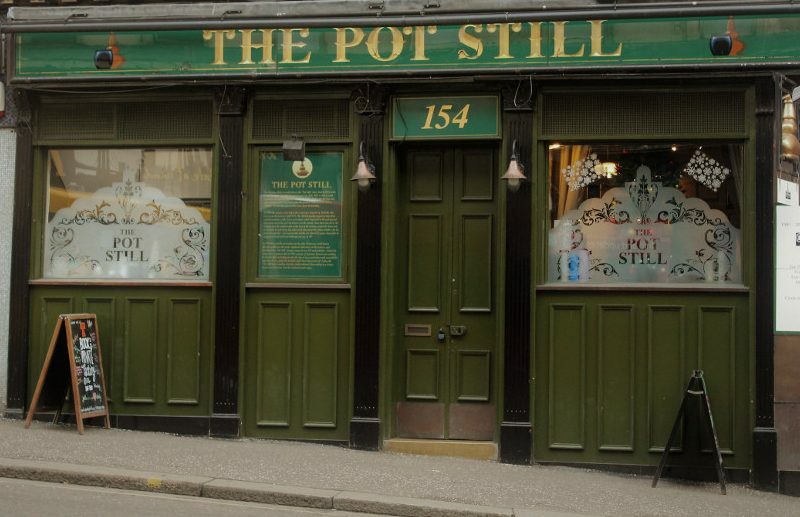 The Pot Still is the place for malt whisky in Glasgow. With over 700 whiskies, cracking cask ales, proper pies, friendly staff & great service. 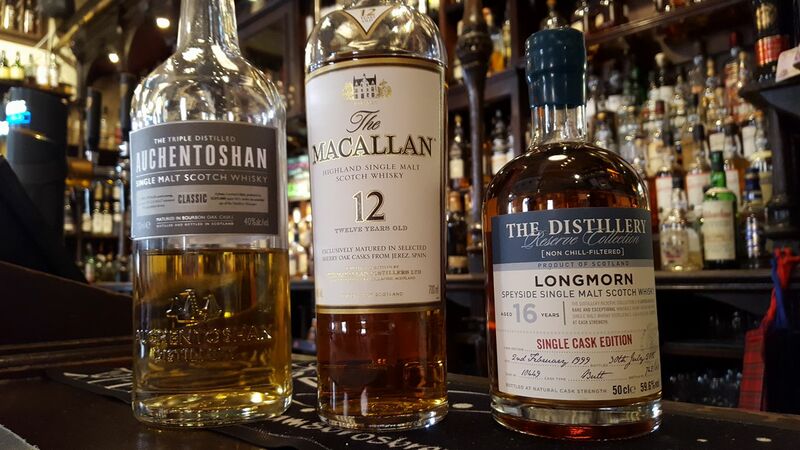 The Pot Still specialises in whisky and we pride our self on finding every customer their perfect dram,. With our expert staff on hand to guide you around the array of whisky from every corner of the world we are sure you will find the dram that fits. Why not try one of our homemade pies to go along your whisky, ( The Pot Still pie goes down a treat!) a wee half pint of one of our superb ever changing cask ales or a bottle of some of the finest Scottish and German beer you can find. We host whisky tasting throughout the year or for something different why not inquire about having your own private whisky tasting session. 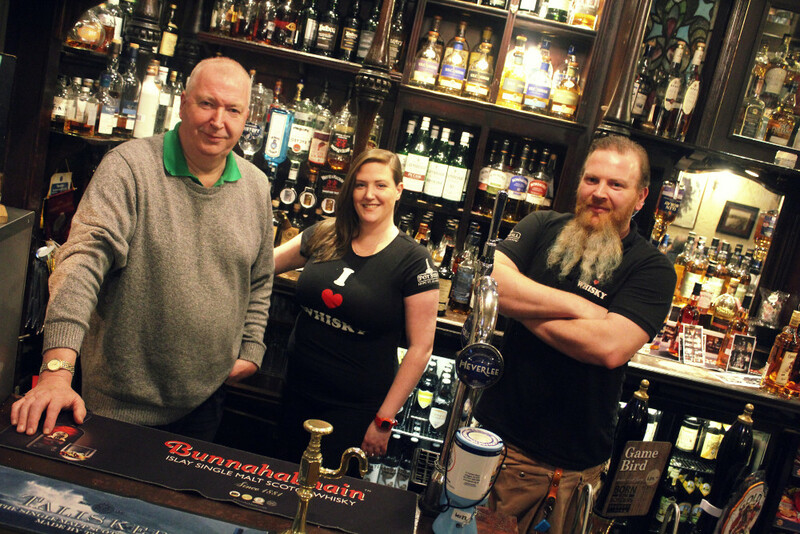 The Pot Still is currently owned by the Murphy family pictured above, but let me tell you a bit about the rest of the families who have ran the bar. The first tenant recorded was John Hill, a wine and spirits merchant who operated the premises in 1867. William McCall and his family were the first family to own the bar back in 1886 when it was called McCalls bar. the bar seen several generation of family and friends of the McCall at the helm right up until the early 1960’s when the Tennents Caledonian breweries group took over. Tennents made extensive alterations and refurbished the pub including the addition of the lounge at the back in 1971. The bar was run by Tennents managers until 1981 when the bar was taken over and The Pot Still was introduced. The Waterstone family took over the bar in 1981. The father/son team John and Paul Waterstone and made some alterations and were the first to introduce the name The Pot Still and started the whisky bar with over 300 bottles on the gantry. The family owned the bar until the early 1990’s when manager Ken Storrie took his turn behind the bar. The Storrie’s were the next family to have there time in this whisky institution. Kenny and his wife Sandra and 2 young kids in tow , Natalie and Pamela, started as the managers and quickly took over as the least holders and increased the whisky stock to over 500 bottles. Kenny went on to win the SLTN Whisky Bar of the Year 2003 & 2004 and Whisky Magazine’s, Whisky Icons Whisky Bar of the year 2005, 2006 & 2007 and cemented The Pot Still’s world wide reputation as THE whisky bar to visit in Glasgow. The family hired a new bar manager in late 2003 and the first Murphy started work – Frank Murphy. The Storrie family owned the bar until Kenny’s sad passing in November 2010. Here come the Murphy’s !! So as we already said Frank Murphy started here in late 2003 as the manager and quickly got his sister Geraldine involved with helping out with some shifts behind the bar……………….and the rest they say is history. The Murphy family have been involved with the bar ever since with various brother, sisters and cousins have their time behind the bar. The family took ownership on 28th Nov 2011 with dad Brian, brother Frank and sister Geraldine in the driving seat. We have went from strength to strength continuing the family run tradition of The Pot Still, and the bar now boats over 700 whiskies from all over the world on the bulging gantry. We were delighted to celebrate both The Pot Still’s 35th anniversary and our 5th anniversary in Nov 2016, we were also amazed to win both the Scottish Dram Awards Whisky Bar of the Year and Scottish Field magazine’s Whisky Bar of the Year Award in 2016 and The SLTN Whisky Bar of the Year 2017.